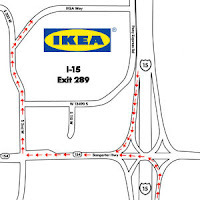 Laci & I headed to the grand opening of IKEA last night. We grew up shopping at IKEA with our Mom, so we were both very excited to see what this new store would have to offer. I must say that I was very impressed with how the opening was handled. Traffic was being directed and parking was a cinch. If you have ever been to an IKEA, you know that the flow of the store allows for large crowds without feeling too overwhelming. We stayed away from the restaurant and cafe because of the long lines but I'm looking forward to going back to try out the Swedish meatballs. I was pleasantly surprised that merchandise was fully stocked (even at 5:00 pm) and that there were plenty of customer service reps to help you through the maze. The only thing I would have done away with was the really loud live band playing at the entrance. Other than that, I give my two thumbs up to the blue and yellow warehouse!